These pinion gears fit 5mm shaft diameter motors and .8 Mod spur gears. Please make sure your spur gear is compatiable with these pinions as there is a possibility of destroying your spur gear if the pinion does not match. Extra Hard 15t, 5mm, .8 mod pinion Fits: 5mm Shaft motors and Traxxas E-Maxx Spur gears...and .. Extra Hard 16t, 5mm, .8 mod pinion Fits: 5mm Shaft motors and Traxxas E-Maxx Spur gears...and .. Extra Hard 17t, 5mm, .8 mod pinion Fits: 5mm Shaft motors and Traxxas E-Maxx Spur gears...and .. Extra Hard 18t, 5mm, .8 mod pinion Fits: 5mm Shaft motors and Traxxas E-Maxx Spur gears...and .. 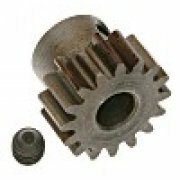 Extra Hard 20t, 5mm, .8 mod pinion Fits: 5mm Shaft motors and Traxxas E-Maxx Spur gears...and ..